Over a lifetime, a spinal cord injury can be both expensive to treat and highly limiting to an injured person’s ability to do a wide range of activities. When such an injury is the result of someone else’s negligence, seeking compensation can help the injured person and their family bear the costs and secure a more stable future. A spinal cord injury occurs when the nerves inside the spinal column are damaged or severed. The site of the injury and extent of the damage determine the extent to which the person’s ability to move is limited. Because the spinal cord contains nerves that control every other part of the body, even basic functions like breathing, urinating, and maintaining body temperature can be affected. 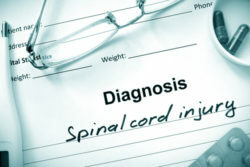 Most spinal cord injury cases are based on the legal theory of negligence. To prove negligence, you’ll typically have to demonstrate that the person or company you’re suing had a legal duty to use reasonable care but didn’t, resulting in your injury. Spinal cord injuries caused by defective products (like a safety system that failed in a car accident) or medical malpractice (like a surgery error) follow slightly different rules, as do cases in which someone’s deliberate action (like attacking you) caused your injury. If you succeed at demonstrating that the other party was at fault for your injury, you are typically entitled to compensation in the form of money damages. Common types of damages in spinal cord injury cases include past and future medical expenses, lost wages if you cannot work, property damage costs, and pain and suffering damages.